The Ukiyoe Small Museum is owned and managed by Ichimura Mamoru, one of the last ukiyo-e artists—numbering around fifty— left in Japan. This unique art form first emerged in late sixteenth century, and usually depicted scenes from everyday life. It wasn't until the eighteenth century that ukiyo-e became a popular art form, thanks partly to advances in woodblock printing techniques. The subject matter of the prints also changed from everyday scenes to female beauties, kabuki actors and sumo wrestlers, scenes from history and folk tales, travel and landscapes, flora and fauna, as well as erotica. The influence of these charming woodblock prints spread far and wide, with the likes of van Gogh and Monet drawing inspiration from their unique style. Ichimura Mamoru started training in ukiyo-e at a very young age from his grandfather. Mamoru took over his grandfather more than fifty years ago. In the early 2000s he opened the museum in order to spread the word about this wonderful dying art. A mid-19th century ukiyo-e showing the woodblock printing process of ukiyo-e.
Making woodblock prints is a multi-stage process, usually involving different craftsman. At first a design is made on paper, which is then carved into wooden blocks. Then colored ink is applied to the blocks and the pattern is impressed into sheets of paper to print the design. Usually, different wooden blocks are used for each color with different parts of the carving raised for each individual color. 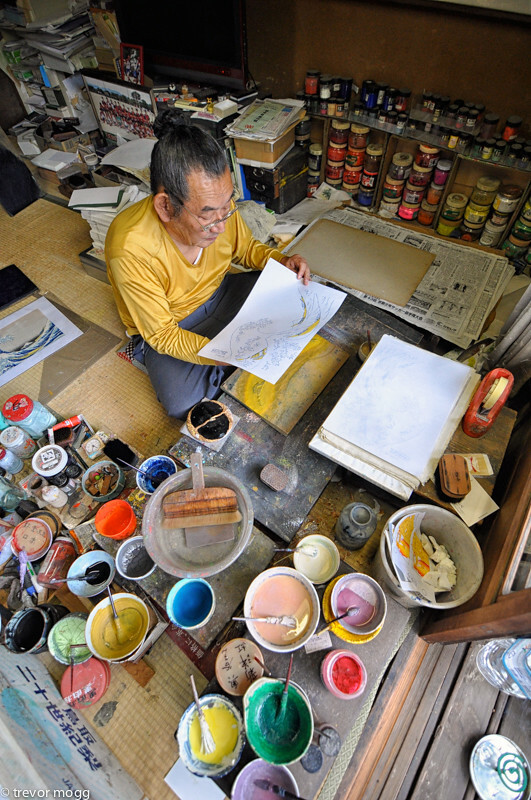 Ichimura Mamoru performs all the three roles—that of the artist, the carver and the printer—all by himself. The entire process takes a lot of work, but once the blocks were prepared, it becomes easier to mass produce the same design. Ichimura Mamoru’s museum became very popular a few years ago when images of the unusual sign he had put up in the front caught the attention of the internet. The original sign was in Japanese. It was so honest that a tourist helped him translate it into English back in 2003. Since then, Mamoru’s museum has been enjoying a small amount of fame.